← Pike Island – Bike, Hike, or Have a Good Cry. I know. You just got the last post and here he is again, all emaily (sp)and Facebookie(sp). Well, today is special. It is the first ever Mystery Photo Friday. It works like this. You correctly guess the place where the photo was taken, and you may win valuable prizes. Send your guess in as a “Comment” to the post. I’ll keep track of all the correct answers, place them in a dark container, blindfold Lois and then I’ll draw the winner. Sound fair? On the following Friday, I’ll announce the winner. Your prize will arrive in the mail shortly thereafter (you’ll have to send me some kind of mailing address). Now, this is getting complicated. You can always forgo the prize if you want. It’s not that great anyway. I’m making the first Mystery Friday Photo pretty darn easy. Don’t expect that same treatment next week. If you don’t live in or around the Twin Cities metro, you’ve got it a little tougher. Try a search engine and see what you come up with. The World Wide InterWeb is very smart. Here’s a few more shots if you’re having trouble identifying the first one. Your prize is in the photo below – not just one like the one I’ve got in the picture, but a whole pack, and they’ve never been opened, even. Good luck. This entry was posted in Photo Friday. Bookmark the permalink. What are you wearing shorts? It looks like the photo was taken today. I was thinking Northrup Auditorium, in the first photo, but then the second and third photos were pulled back and Northrup definitely is not right, ….I haven’t a clue given the wide open spaces. The “Q” -tip is obviously a Red herring or some other fish type reference,…..maybe you smell like a herring Corey…., or maybe, clean your ears Corey, …or, maybe ur playing in the wrong key??! !, another reference to cleaning your ears. 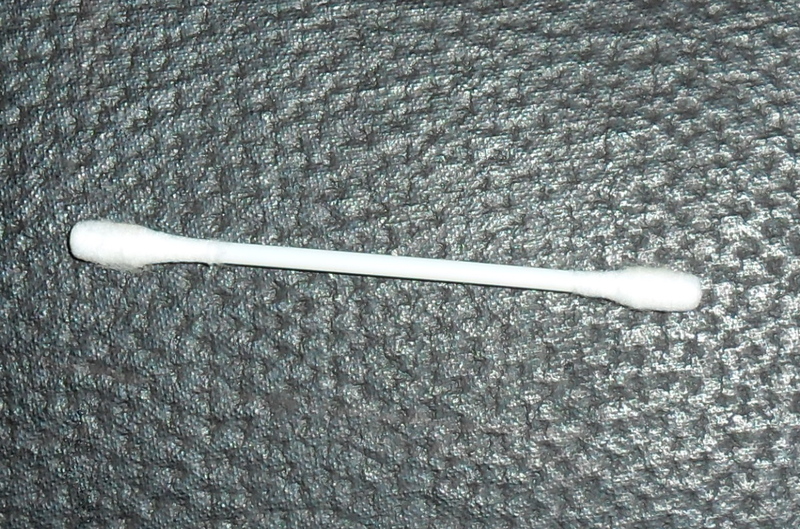 I give up…the “Q-tip” , is why…..? wha…? No matter the peripheral questions, YOU ARE OBVIOUSLY OFF THE PORTAGE TRAIL COREY>>>get out your compass and start trying toremember which turn may have been the beginning of the problem, it was sposta be only 263 rods….Good luck. Is it the Capitol Building? I thought I recognized the court building in the distance. 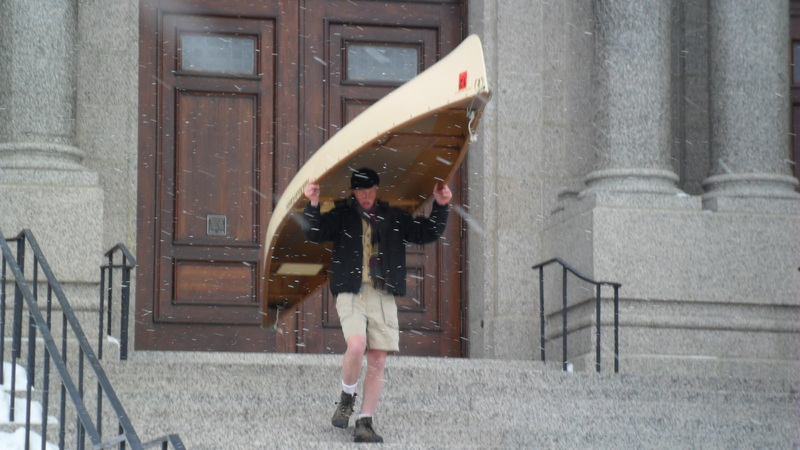 “Corey, you got some ‘splaining to do.” What were you doing carrying a canoe in shorts in the winter and so far from water? Where was your hat? Where were your gloves? Where were your long trousers? 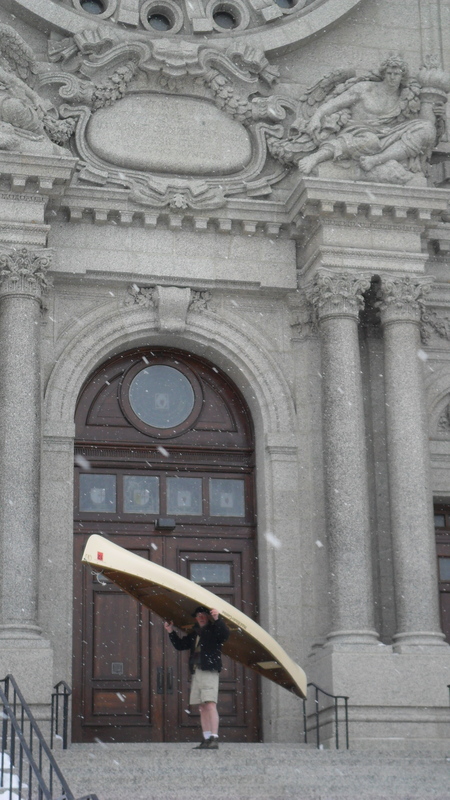 Where, if I may be so bold, was your paddle? Do I win a Q-tip? Cindie, Not to worry. All correct answers are in the grab bag for the drawing. Very close. It does need a new roof. You’re correct. The additional photos made it too easy. But I did guess the Cathedral before I scrolled down. The backdrop for the Mad River looks good. 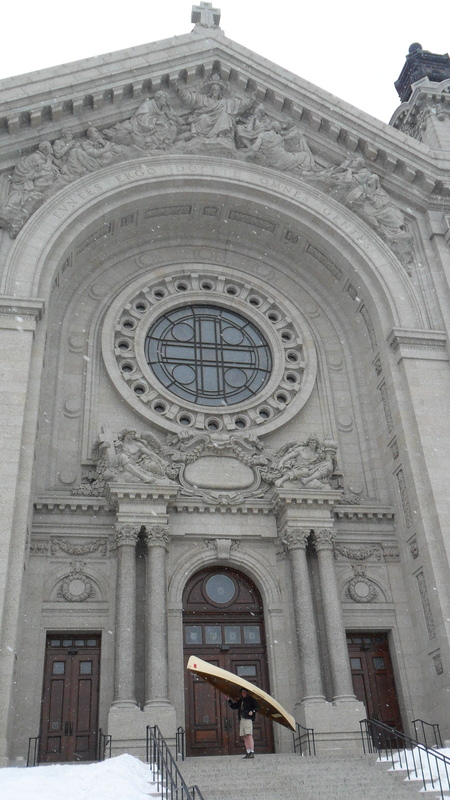 the Cathedral of St. Paul, the #2 of 43 attractions in St. Paul!!! 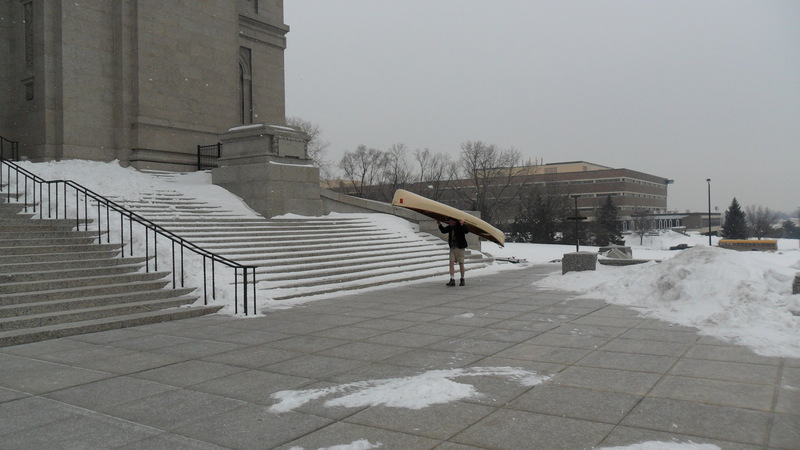 I was going to say the Minneapolis Institute of Arts, but I knew the doors were not quite right. 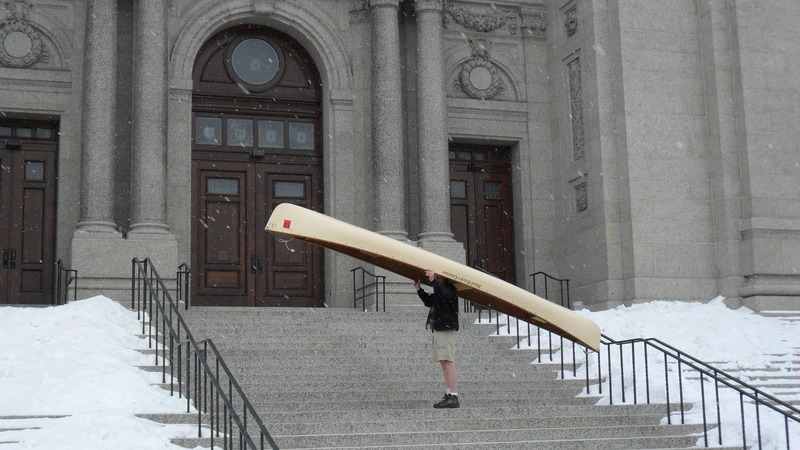 Then, of course you’d pick something closer to home, with that canoe on your head: The Cathedral of St Paul. Does it still need a new roof? You’re correct on location. I fibbed about the roof. I think it’s just fine. I’ll go up top and take a look though, just to be sure. Best wishes to all your valentines. 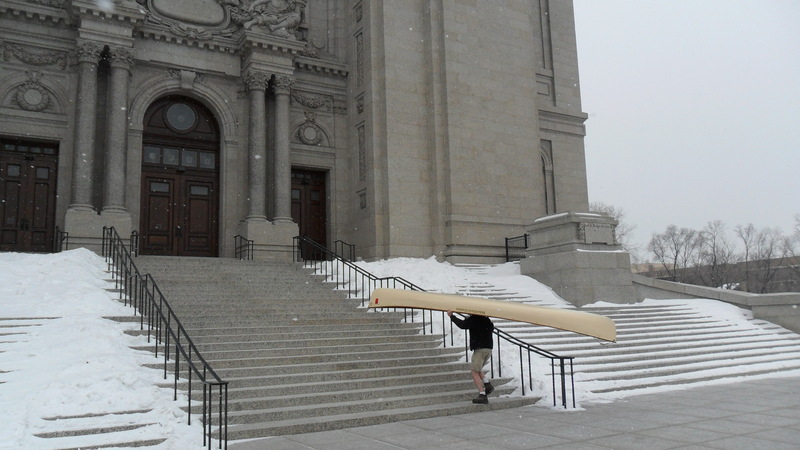 This St Paul native knows the Cathedral when she sees it, been up those steps many times, maybe not with a canoe, but some of those rosaries and prayer books were pretty heavy! Careful, or Dan will hear you…or perhaps not, eh?